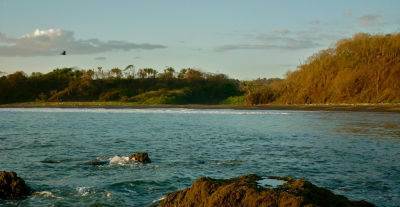 Vista Rosario is a large, beautiful property located near San Juanillo, Guanacaste, Costa Rica. This lush jungle property features views of the private Playa Rosario beach, surrounded by a protected nature preserve. The installed building pads feature ocean, beach, river, and valley views. Located just several minutes drive from the town of San Juanillo, Vista Rosario provides easy access to restaurants, a market, and several stunningly beautiful beaches, great for snorkeling, surfing, swimming, and fishing, among other activities. The nearby town of Nosara features many restaurants and several markets, as well as the local airport, with daily flights to San Jose. At just over 3.5 hectares and with plenty of public road frontage, Vista Rosario is perfectly situated for a tropical development or tranquil jungle retreat!